Budget Friendly Do-it-Yourself Elk, Deer & Bear Hunting. Log Cabin Lodging, Meals and Camp Manager. Affordable Self-guided Rifle and Archery Elk, Deer and Bear Hunting Packages! Unguided Archery and Rifle Hunting Packages starting at only $1,595 include Log Cabin Lodging, Camp Manager, Topographic Maps of Area and Great Home Cooked Meals. No Cold Drafty Wall Tents. Our Accommodations include Comfortable Beds, On-Demand Hot Showers, Gas Heat, Fireplace, Satellite TV and a host of other Great Amenities. The night of your arrival our Knowledgeable Camp Managers will review topographic maps and areas where elk are commonly found! 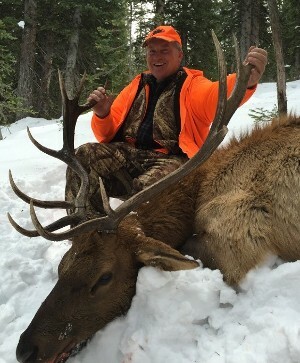 Excellent opportunity rate on elk encounters/harvests! Elk Hunting Trips That Fit Your Budget! Hunt at your own pace. Varing terrain to fit hunting abilities of all ages! Elkhead Mountain Lodge directly borders over one million acres of prime elk country! Your day starts out with coffee and breakfast. From there you take to the field with either a packed lunch or return to the warmth and comfort of Elkhead Mountain Lodge for something hot before the evening hunt. Upon your return, a full course dinner will be waiting for you including great meals like spaghetti, meatloaf, ham, turkey and dessert. After dinner relax in the comfort of the lodge watching the game, playing cards or just relaxing in front of the fireplace. Elkhead Mountain Lodge is home to some of the best elk hunting to be found. Affordable hunting packages. Great home cooked meals and knowledgeable camp managers to ensure your trip is one to remember. Most shots are within 100 yds. We have openings in both over-the-counter elk tag seasons and quality limited draw seasons. Seasons are 5 or 9 days with arrival the day before the season and departure the day after the season. Meat processing and packout service available and meat freezer on the property.